This post is a little long, but it should be, since this was one of the most exciting race experiences I have ever had. Wow! By far the coolest race I have ever done…ever. 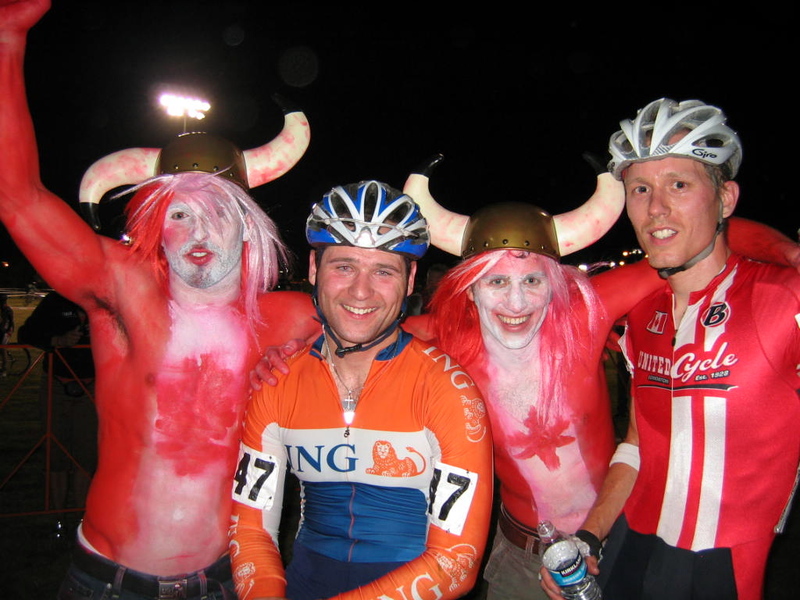 Awesome course, awesome music, awesome fans, awesome competition, and of course Lance-frickin-Armstrong! The course itself was a 2.7 km loop that wound it’s way around the Desert Breeze Soccer complex complete with 15,000 screaming fans. These organizers sure now how to do it right as the set up was perfect. The beer gardens was located right at the most fun part of the course – the Run Up with the 180° turn back down the course. The Pedalhead boys had a prime viewing spot as they were right in the middle of this section. Thanks for the cheers boys. It was Vegas, and it was hot. I couldn’t get my throat to feel not dry and I hadn’t even started racing yet. Heemer and I rode to the venue from our hotel. It was an 8 mile ride. Pretty cool experience signing in as Travis Brown and Steve Tilford were ahead of us, while Thomas Frishnick and Florian Vogel were behind us in line. Once the women’s race was finished we had 20 mins to pre ride the course. (Again, excellent planning via the organizers) I spent most of the time following the wheel of none other than the current World MTB Champion – Christoph Sauser. So the top 40 guys out of the 99 starters were called to the line – my # was 47. I thought this was good, but it didn’t matter. Heemer was called up #24 and the big guy Lance was 38th. 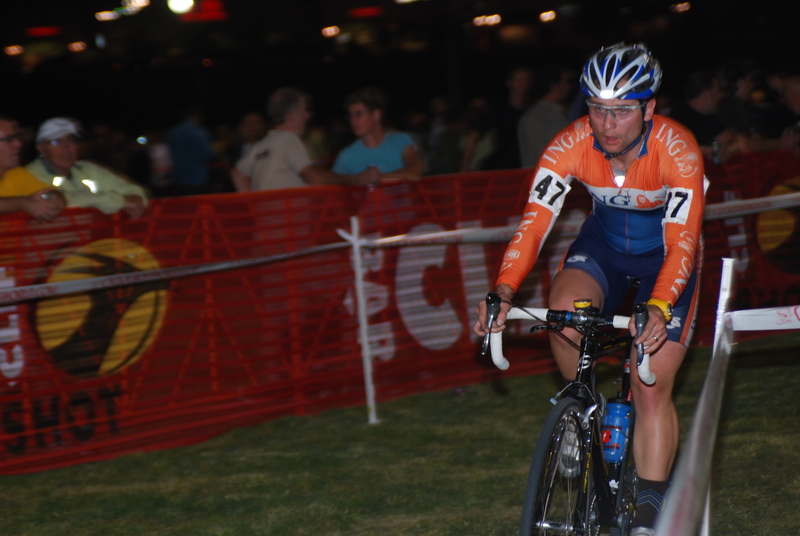 Lance got the first non-UCI point position and Sauser was called in 40th position – but that didn’t really matter because the typical “race” for starting positions already began by the back guys once Armstrong was called up. So I did my best to get in there but alas, once I claimed my spot and looked back I could only see on guy behind me. Damn. So it was a pretty big build up to the start – music was pumping – so was my heart. Bang and we’re off! Thanks to all those Wednesday ‘cross session starts I was boom into my pedal and I did a slow speed snake thru guys who couldn’t clip in. Snap, moved up 8 spots before corner 1. 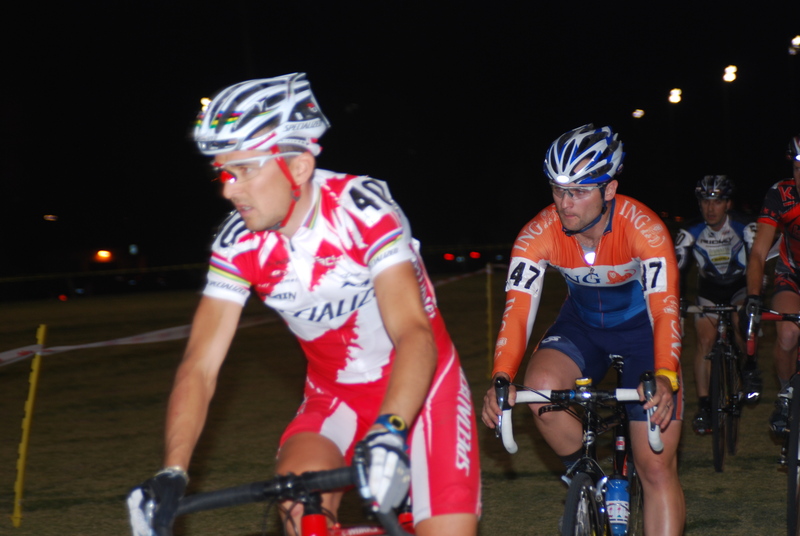 As I planned, I used my fast starting skillz to pass guys and move up on the left (inside) of the start loop. After some YouTube analysis, I can proudly say I went from back row at the start to 32nd position before the start loop was completed. Yup, I passed a whole bunch of guys, including none other than the big guy, Lance Armstrong. It was a very surreal feeling as I hammered and looked over at Big Tex as I went by. I found this photo on the Las Vegas Sun’s website of Lance on my wheel. The photo was definitely taken well after I passed him after corner 2 of the start loop. So basically, Lance jumped on my wheel and rode the draft as I moved us up a # of places. Super Cool! 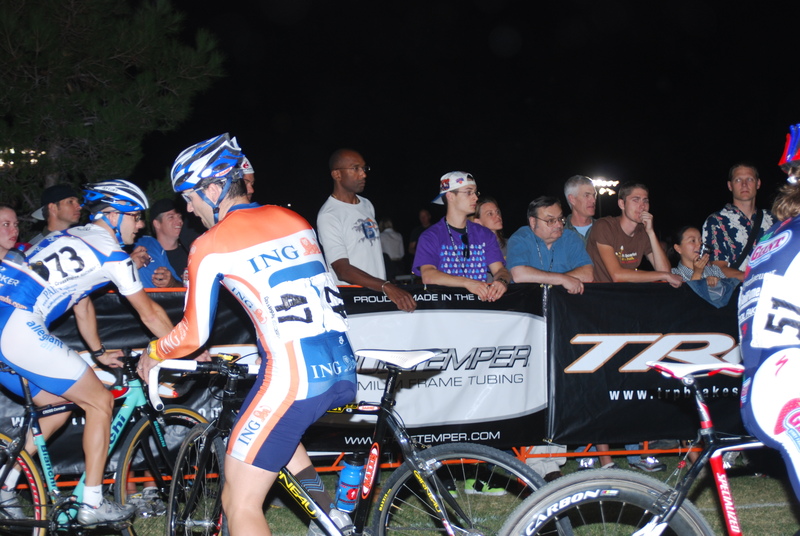 So I moved up a couple more places before I settled in behind the young rider Adam McGrath of Van Dessel. I figured here was a good spot to try to say. Probably right around 30th position. Well, unfortunately my good race ended there, as I went into the set of barriers at the Beer Gardens high on adrenalin and way too hot, as my speed was greater than my legs could move under me and I stumbled over the 2nd barrier, had my bike smash into my back, and I got clipped by adjacent racers. Up I popped but my chain was off and my rear brake was undone. That sucked! I basically had to coast to the back of the whole race so I could safely repair my bike. Now I’m off the back – disappointing. So I tried my best to ride as hard as I could, but it’s always difficult to push when you’re racing by yourself. But the spectators truly kept me going. The fans cheered just as loud for me riding on my own as they did for the leaders. And once I decided to risk disqualification to have some fun and participate in the beer gardens the fans cheered even louder. So, for the 2nd half of my “solo” race I scouted for every dollar bill and beer feed out there. In total I made $9 bucks and downed 4 beers. 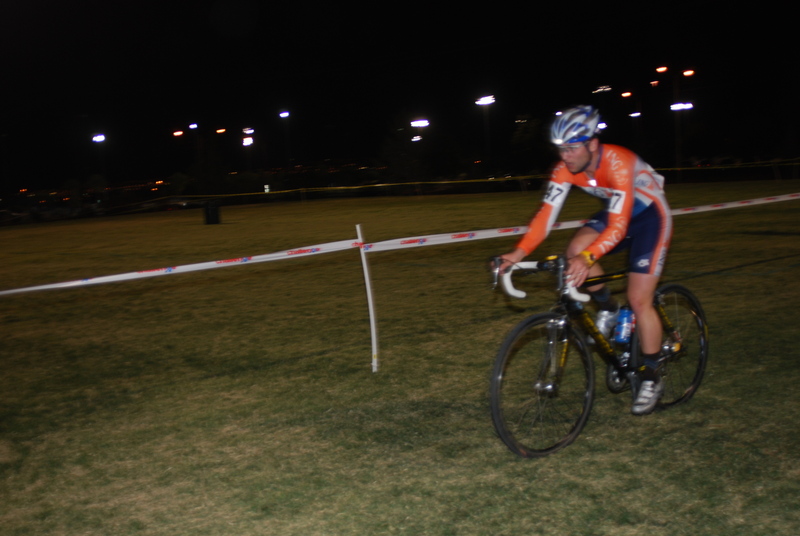 Being DQ’d was totally worth it as it salvaged my Cross Vegas experience and I had a blast. With my last beer feed I made sure to drain the whole can and I raised the empty up in the air to a roar of cheers from the crowd. So my solo riding was no where near as fast as the leaders nor the Armstrong group, so they lapped me with about 20 mins to go. It was cool to look over and see Lance Armstrong coming by – but it was even cooler to see Heemer right on his wheel! Apparently Tim rode in the Armstrong group for most of the race and he finished 23rd, one spot behind Lance. A special thanks to Matt Decore for hooking Heemer and I up with Mafia Racing from Colorado. They helped us out with a home base for the race. Cool fast guys. This was one of the best experiences of my racing career, not best races, but best racing experience that I will always remember. It’s not everyday you race with Lance Armstrong, or lead him out through a start lap ☺. One week away – I’ll be rippin’ it with 96 other fast dudes (including Heemer) and 9 o’clock at night just off the strip. Sounds like a good time to me that’s foresure. I’m getting pretty pumped! I’ve been riding this trail a lot these last couple of weeks. 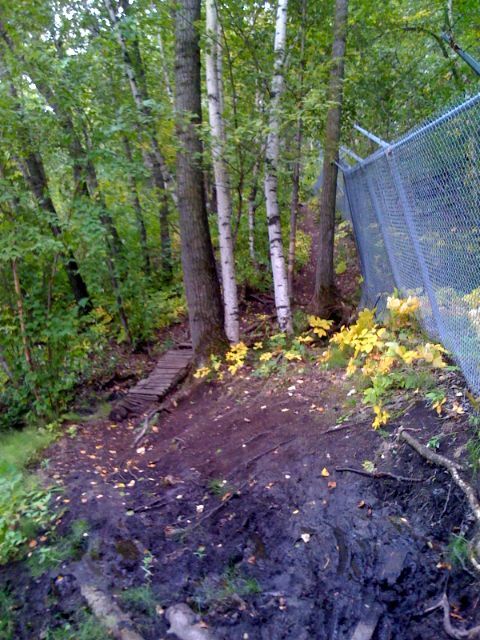 I discovered another trail in the city too – Roddi let me know about Fulton Ravine…an hour or so of work with a chain saw and it would be perfect. So Hard my Teeth Hurt? ‘Cross season is fun – training for it is not. My first set of 30/30’s today made my teeth hurt.